Men traveling by donkey cart through the Khomani San community in the southern Kalahari Desert, South Africa. Photo courtesy of Brenna Henn. Geography and ecology are key factors that have influenced the genetic makeup of human groups in southern Africa, according to new research discussed in the journal GENETICS, a publication of the Genetics Society of America. By investigating the ancestries of twenty-two KhoeSan groups, including new samples from the Nama and the ≠Khomani, researchers conclude that the genetic clustering of southern African populations is closely tied to the ecogeography of the Kalahari Desert region. A Nama man holding whip outside his tent while herding sheep and goats in the Richtersveld, South Africa. Photo courtesy of Justin Myrick. 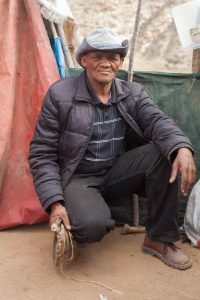 The name KhoeSan refers to several indigenous populations in southern Africa; KhoeSan people speak “click” languages and include both hunter-gatherer groups and pastoralists. They are genetically distinct and strikingly isolated from all other African populations, suggesting they were among the first groups to diverge from the ancestors of all humans. Much scientific interest has focused on the KhoeSan as researchers try to reconstruct this early divergence; however, little genetic material was collected until the past decade. Brenna Henn, of Stony Brook University in New York, has been studying southern African population genetics for over a decade. She notes that there is a tendency to lump all indigenous southern Africans into a single group – often called “Bushmen” – but in fact, the KhoeSan includes many distinct populations. She and her team set out to explore genetic diversity in the area and to better understand the differences between these KhoeSan groups. “For the last twenty years or so, there has been a lot of interest in understanding how genetic patterns are determined by geography in addition to language,” says Henn. The genetic differences between human populations are strongly correlated with their linguistic histories, and both of these factors are also linked with geography. Henn argues that ecology and geography together are likely a better explanation for the genetic differentiation between groups than either linguistic differences or method of subsistence (i.e. hunting/gathering or farming). However, much of the research on southern African populations had previously focused on linguistics and subsistence, with little attention paid to ecogeography. Henn and her colleagues analyzed genetic information from the KhoeSan. They collected genome-wide data from three south African populations: the Nama, the ≠Khomani San, and the South African Coloured (SAC) group. Their analysis also included samples from 19 other southern African populations. It quickly became apparent that the geography of the Kalahari Desert was closely tied to the population structure that they uncovered. The outer rim of the Kalahari Desert presented a barrier to genetic mixing, while populations that live within the Kalahari basin mixed more freely. Henn points out that there are more KhoeSan populations who were not sampled. Sampling in the area is a significant challenge for a number of reasons, including the complex politics of the region in the post-Apartheid era. Most populations in South Africa and Zimbabwe no longer identify as KhoeSan and have been absorbed into other populations over the past 500 years. Still, their findings add to the body of knowledge surrounding the history of southern African populations – while also complicating them. “There are a lot of threads of information to bring together – linguistics, subsistence, geography, genetics, archaeology. They don’t always reconcile easily,” says Henn. 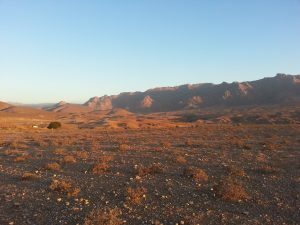 View of arid mountains at dusk in the Richtersveld Community Conservancy, South Africa. “The first author on this paper, Caitlin Uren, is a South African student. I’m very proud of our collaboration and her excellent work,” says Henn.